Time: 7:00 p.m. - 10:00 p.m. Time: 8:00 a.m. - 3:30 p.m. Please try to arrive 15 minutes before the prayer timing to avoid traffic congestion in the parking area. The following arrangements have been made for those who are planning on giving Udhiyya ( sacrifice ) locally. We are pleased to announce that we are trying to facilitate the Udhiyya (Sacrifice/Qurbani) program as a part of Eid-ul-Adha. This is the seventh year running that we are trying to organize this event for the community members. We hope & pray Allah that HE (SWT) makes it a smooth & blessed event yet again. Inshallah, the Sacrifice is planned for Tuesday, Aug 21 2018, the day of Eid ul Adha and/or Wednesday, Aug 22 2018. The location for sacrifice/Ourbani is about 35 miles from IFN. We are accepting requests but it’s limited to 50 spots. It’ll be accepted on a first come first serve basis while the spots are still open. Cost is approximately $260 for a Lamb/Goat. If you are interested in reserving a spot, please contact Br. Ateeq Jaffer ASAP & no later than Sunday, Aug 12 2018. May Allah bless us all very well & help us fulfill this beautiful sunnah of Prophet Ibrahim (AS). Aameen. 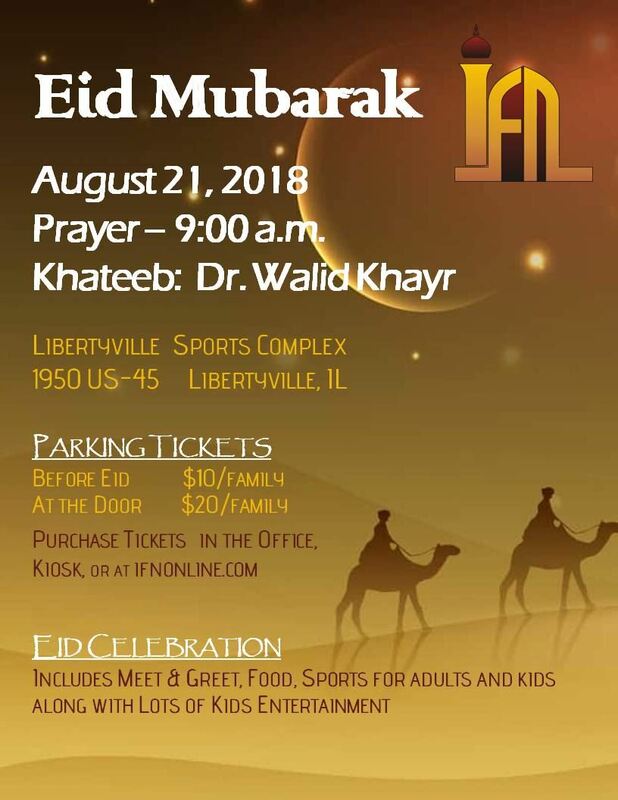 Come celebrate Eid-ul-Adha with the community and enjoy the day together! IFN offers Eid-ul-Adha prayer every year. Typically, IFN tries to reserve a venue that will allow families to stay and partake in festivities together. The venue may vary, but announcements are made and registration to purchase parking tickets will be posted online on an as needed basis. 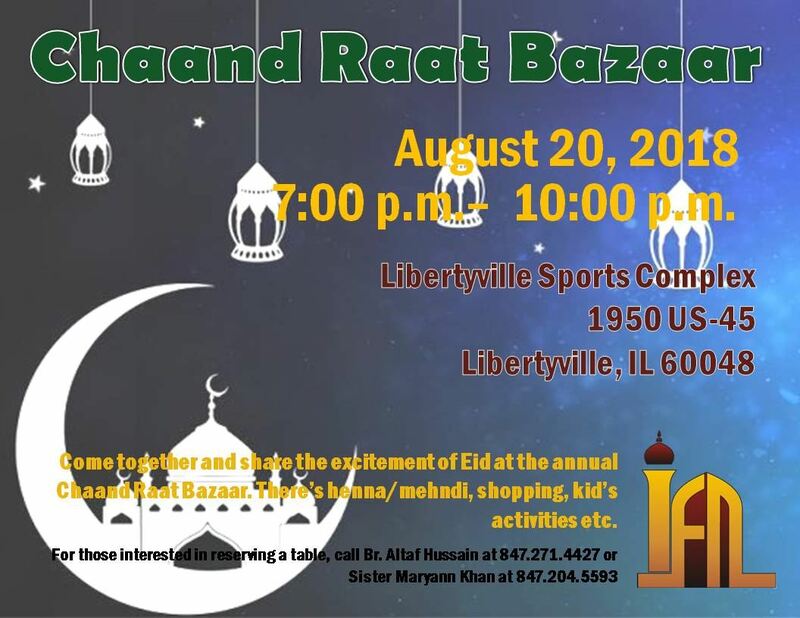 Also, the night before, IFN does try to provide a Eid Bazaar (Chaand Raat) if enough vendors are interested. For those interested in performing the Qurbani/Uddhiya themselves, IFN also coordinates this option with a local farm owner/butcher when possible. Space is limited, so keep an eye out for updates, announcements, and check back here for further information. Lastly, Eid is always a busy time of the year, so if there are individuals who could dedicate some time to helping out with coordinating the event, don't hesitate to ask the Executive Committee how you can support the day.